Master Bernard Redfield is the owner and head instructor of Redfield Martial Arts, Founder and Head Master of The Red Dragon Tang Soo Do School. 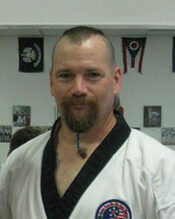 He has been involved in martial arts since the mid 70's . He began his martial arts journey under the guidance of Sensei Vincent Ursone in Samurai Judo in Stamford CT. Master Redfield began his study of Tang Soo Do in the 80's under Master Joseph Devita in Grenwhich CT while attending Propersi Institute of Art where he graduated with ABK honors. He continued his training under Master John McGuiness in Stamford CT. Master Redfield achieved Internationally Certified 6th Degree Black Belt with the Tang Soo Do Mi Guk Kwan.and a 4th Degree Black Belt in the World Traditional Hapkido Federation under Master Art St. Armand, a Certified Level 3 Basic Knife /Counter Knife Instructor with Force Necessary Master Hock Hochheim. Master Redfield is also a Reiki Master practitioner he received his training under Master Rena Cupples, Master Phran Gacher, and Master Martin Lee. During his 28 years with Tang Soo Do Mi Guk Kwan Regional Director for Region 3 (Virginia's, Carolina's, Georgia) and served on the Board of Directors, Master Redfield left the Mi Guk Kwan and formed Red Dragon Tang Soo Do School to better serve his students by combining his knowledge of Tang Soo Do, Hapkido, Judo, Kali and Knife Counter knife Combatives to give his students a well rounded and street effective system of Martial Arts. 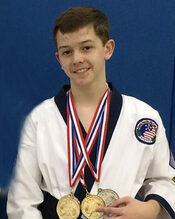 An avid tournament competitor, Master Redfield travelled throughout the U.S. Europe and the U.K. competing in State, Regional, National and International Championships, compiling over 300 medals and trophies, He is uniquely qualified to bring out the best in his students weather for self defense or competition. Joseph Snyder has been training at Redfield Martial Arts since 2009, Joseph has been travelling with Master Redfield competing in many karate tournaments. Joseph helps teach classes with Master Redfield and on his own.